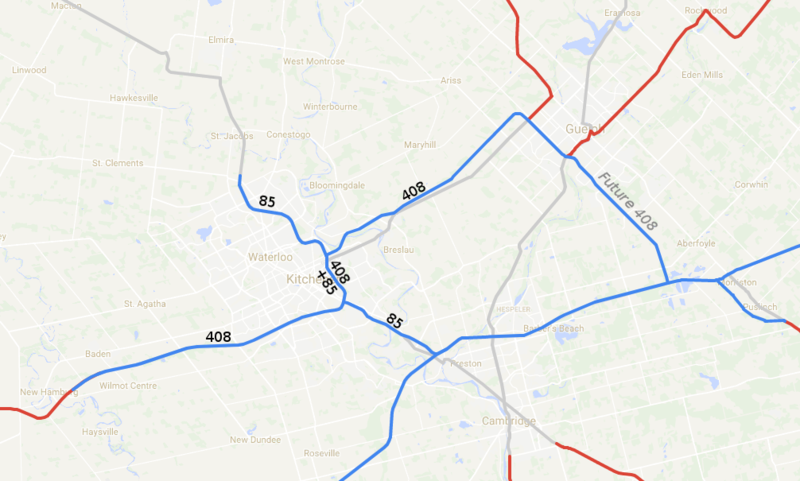 What should the new freeway between Kitchener and Guelph be numbered? Construction on the new freeway linking the Conestoga Parkway in Kitchener with the Hanlon Expressway in Guelph is set to resume soon. The question now is, what should it be called? Should the Highway 7 number be shifted over to the new alignment? That would leave 7 as is through Kitchener and Guelph. Should it be given a unique number? Should that number be applied elsewhere (Hanlon, Conestoga, etc.)? Should further changes be made to the highway numbering in the area? Or just keep it as is? Nope. He's a DOT employee, so what we say could actually affect the outcome. 407 is the obvious choice. Does Ontario have a numbering format for new/former alignments? Tempted to use 437 because it has a "7" and lots of folks tended to think that would be the next US Route. But the 400-series all seem to be interconnected, so this would be an orphan to that system. 107 works for me - there's enough visual space by having multiple digits, it's similar enough, and it's an unused number. Of course, this is quite similar to the model used in much of the northeastern US (or Mississippi). ON 7 would seem to make the most sense to me. Highway 469. You know you want to do it. I think the historical pattern (last 20 years, anyway) has been to route the highway onto the new alignment, then download the old alignment back to the region. From a roadgeek perspective, I would prefer to see the new alignment get a new number and keep the old alignment in the system. But from a practicality perspective, I would imagine Ontario wants to maintain its mileage instead of maintaining two parallel highways serving similar functions. On topic: Would Ontario ever consider a US-type system of business routes? The old road could be Business 7 - doesn't even need to be fully (or at all) provincially maintained. I'm guessing from the figures above, it won't be a freeway, so no 4##. Seriously though, I agree with the others. I wish I could think of something more clever, but having the new roadway as highway 7 would be the most logical thing to do. The old (current) highway 7 would become a new county route (not sure if there is a current county road 7 in either Wellington or Waterloo counties). I would say move ON-7 to the new highway, and if the old road isn't going to be downloaded, make it ON-7B. 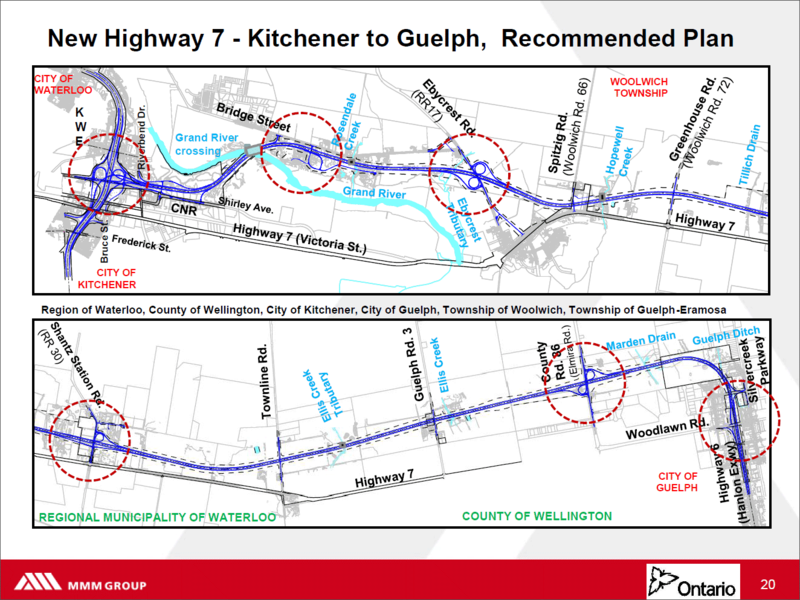 The new highway should become Highway 7, while the old highway west of Woolwich-Guelph Townline can be an extension of Waterloo Regional Road 55. East of Woolwich-Guelph Townline, it could become Wellington County Road 55. The old road is almost certainly getting downloaded. This is Ontario. There is zero redundancy in what they maintain. Being serious, move 7 to the bypass. If ON wasn't so opposed to signing stuff on county-maintained roads, current 7 could become Highway 107. To Alps, rickmastfan67, and cl94: "Download". You keep using that word. I do not think it means what you think it means. Downloading is something you do on a computer. You mean "downgrade". "Downloading" was the term used in the late 90s because 90s. It referred to services going from being provided by the provincial government to a lower, municipal one. The technical term for it, and has been used long before and long after the 97-98 downloading, is "transfer" of a highway. To clear up some confusion, here's the programmed network for the area. Blue freeway, red conventional provincial highway. The new freeway will tie into the Hanlon, which is slated for upgrade to full freeway standard. Ultimately it will provide a continuous L-shaped freeway from Highway 401 to the Conestoga Parkway and an alternative to Highway 401 et al between 401 and KW. In 1997 and 1998, many sections of the provincial highway network were downloaded to local municipalities (such as cities, counties or regional municipalities) by the Ontario Ministry of Transportation as a cost-saving measure. While highways were occasionally transferred to local governments in the past, the 1997-1998 downloads represented the most significant changes to Ontario's highway network. This was a sad day in the history of Ontario's highways. On January 1, 1998, 3,210 km of provincial highways were transferred or "downloaded" to local authorities. This was in addition to the 1,766 km of provincial highways that were lost on March 31, 1997. The roads that were downloaded ceased to be King's Highways, and became County, Regional, District, or Municipal roads instead. In fact, Harris PC’s had downloaded $3 billion of costs onto municipalities — including child care, transit, housing, and public health — which then led to higher property taxes and an infrastructure deficit. I would had liked to see the K-G freeway extended east to Brampton and Hwy-410 along with a northern extension of the Hanlon Expwy along Hwy-6 north to Fergus and Arthur but I fall into fictionnal highways territory. If the entire thing is going to become a freeway connecting to the 401, I would then recommend renumbering the entire thing as 477 then w/ overlaps of 6 & 7 so those routes don't become disconnected. 407 can still be used though. There's 407 ETR and 407 East, so no real 407 yet. Maybe call it 407 west? In the less technical sphere* of road discussion, it's okay to use synonyms: Downgrade, download, decommission, downgrade, transferred, and off-load seem to be used interchangeably to describe a "higher classification of road changing to a lower classification", even though some of those words have other specific or alternate meanings when using them in other contexts. You wouldn't "downgrade" or "off-load" a battleship from military use, but it can be decommissioned. Losing an airline seat upgrade wouldn't be called getting "downloaded" or "transferred", but downgraded. In a technical or official description, each DOT or form of governance would use a consistent term. In the case of an internet forum or personal discussion, I personally kind of prefer the first way...reading/heading the same word repeatedly when a synonym exists is actually quite tedious. A bypass of the urban section of Highway 6 in Guelph is on the books, but no timeline on that. An ultimate design of where it would meet the new freeway is still to be determined, but traffic patterns and construction staging would all but demand that the Guelph-KW alignment would be the through route. Chris, do you know what becomes of the “old” Highway 7, in other words Victoria Street? 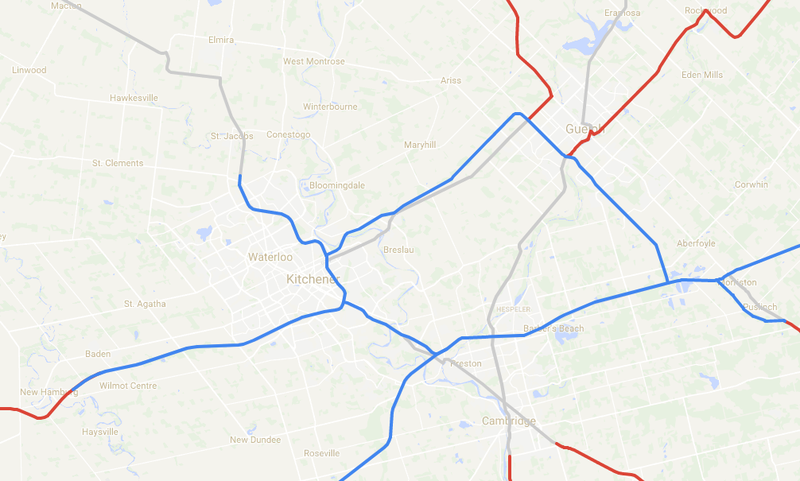 My logic is this, considering that Highways 7, 8, and 85 are freeways in the Kitchener-Waterloo area and no one bats an eye on these freeways not having 400 series numbers, it’s obvious that the new road should be called Highway 7, and the old one could be something along the lines of RR-107 if downloading does occur. Speaking of the term “downloading”, it doesn’t refer to a downgrade per se, but rather governments passing the buck on responsibility. Didn’t Chretien’s government in the early 1990s download certain responsibilities to provinces? I assume download comes from the province being higher than the region/county or city, and if something that was maintained by the city then had its maintenance controlled by the province, it would be referred to as “uploading”. Indeed I recall that term being floated around in the early 2010s in articles suggesting that the Gardiner between Hwy 427 and Humber River be “uploaded” to the province. In that case, I do not despise the idea of a new 400-series designation. I'd assign 408 to an upgraded highway 6/7/8 and reuse 85 for the 401/Conestoga connector.